Ask a Millennial (someone born in the 80s-90s, basically) what’s cool about their workplace, chances are they won’t mention their generous salary. Or the full insurance coverage they receive. Or even their great boss. No, you’ll probably hear something about their free meals, on-site day care, summer Fridays, yoga classes, or the water fountains that dispense Hawaiian Punch. There is statistical evidence that salary, managers, and benefits matter most to Millennials when selecting and staying with a workplace. Yet, what seems to get them most excited is the employee perks. In the Millennial mind, they can get a great salary and insurance benefits from just about any employer. 48% of employees (regardless of generation) think they can find a job that matches their current compensation within six months. But an office that allows working from home, or a “bring your dog to work” policy? That’s not so easy to find, and those types of extra benefits are what may make the difference in engaging and retaining younger employees. They can serve as a bandage over noncompetitive compensation. Their most effective use, however, is to emphasize the better qualities of an employer that is already investing in employees. When added to a workplace that compensates fairly and provides opportunity, perks help remind employees that they’re valued, and that the organization wants them to be happy. That’s an important distinction in the everyday engagement levels of the people who comprise an organization. Currently, just 29% of employees feel valued by their organization. 80% are stressed out by work. The right perk can make a big difference in both of those issues. Employee perks can be costly, but employee turnover is even costlier. Actively disengaged employees are even more expensive. Perks show an investment into the entire person - not just the employee. Remember, Millennials in particular are looking for a workplace that’s human. They see themselves as much more than just another cog in the corporate wheel, and want employers to recognize that. It’s a worthwhile investment on several levels. The good news is perks don’t have to be expensive. A business doesn’t have to offer an all-day fondue station or weekly motivation meetings with Tony Robbins to add some value to its employees. 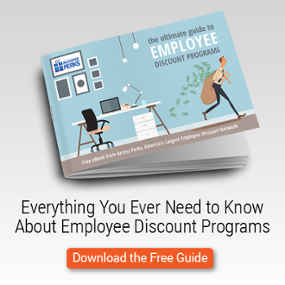 Some perks are inexpensive, such as employee discount programs. Others don’t have much of a hard cost at all, such as unlimited vacation days. The important things are to find what a team values, and encourage usage of the benefits. 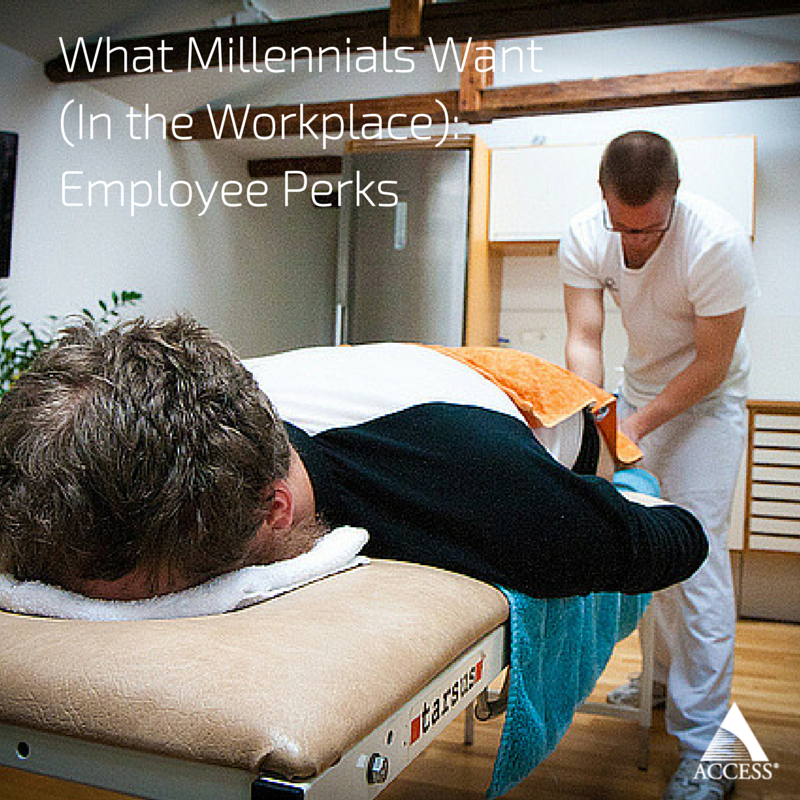 Perks are closely tied to employee engagement and retention. Their role in recruiting may be even bigger, however. They won’t discuss their salaries due to common courtesy, but Millennials have no qualms about bragging about their corporate perks. Plus, read through any area’s “Best Places to Work” lists and the write-ups will focus on the perks. Google’s profile immediately jumps to generous parental leave policies, and Salesforce.com’s mentions volunteering PTO. Both of those places compensate their employees just as well as anyone. But the chance to take a “vision quest” is just stinkin’ cool. Millennials are attracted to exclusivity. They love belonging to things the rest of the world doesn’t understand or have access to. And much like the bearded hipster who (not so) discreetly shares the secrets of his vegan diet with his friends at the farmer’s market, Millennials love one-upping their peers with how amazing their offices are. That makes a unique workplace perk a competitive advantage in attracting talent. Millennials are now the largest generation in the American workforce, and the tail end of the generation is only now beginning to exit college. As cliche as it sounds, they’re absolutely changing the way we work. As tempting as it is to try and maintain traditional standards, it just isn’t going to work. Millennials are too wrapped up in technology, too willing to work around the clock, too interested in proving themselves to fit into older models. What’s at stake is customer engagement and loyalty. The more engaged employees are, the better the customer experience is. The better the customer experience, the more customers return, spend, and share. There are a lot of factors that go into keeping Millennial employee engaged, but corporate perks are one of the simplest ways to keep them dialed in and sharing that love with their peers. So go out and pick up that Hawaiian Punch fountain. Hire that meditation guru or massage therapist. Or just check out Access Perks, our local-merchant take on employee discount programs.